SCFC Your Home in the Line of FIRE! Each year about 40 South Carolina homes are damaged or destroyed by wildfire. 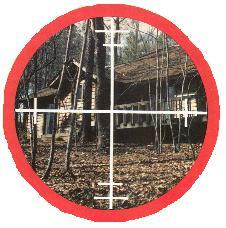 YOUR HOME COULD BE IN THE LINE OF FIRE! Use only fire resistant materials on the exterior of your home whether roof, siding, decking or trim. Protect interiors from sparks and embers by boxing in eaves, screening vents, and underpinning or screening beneath porches, decks, and the house itself. Do not use fiberglass screening. Chimneys should extend above the roof line and be topped with a half inch mesh spark arrester. 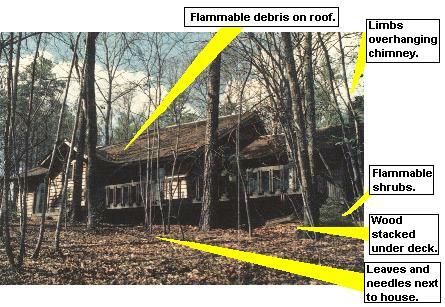 Keep roofs free of debris. Leaves, pine straw, moss and twigs that collect on the roof and in gutters invite disaster. Safely dispose of stove, fireplace, and grill ashes. First place them in a metal bucket, soak with water, and then bury them in mineral soil. Faucets should be located on each side of your home and near any outbuildings. Install them, too, in areas of the yard where fire hazards exist, or where wildfire could enter your yard. Have a coiled hose attached to faucets on opposite sides of your home. Hand tools such as rakes, shovels, and axes should be readily available along with a ladder that will reach your roof. Narrow, steep, or winding roads and driveways can obstruct the movement of firefighting equipment. Make sure firefighters can identify the entrance to your home by marking the drive with a sturdy, easy to read sign that gives your name and address. For your personal safety, plan an alternate escpae route in case your primary access is blocked by fire or smoke. The wider the spacing between trees, the better. Hardwood trees tend to be less flammable than conifers. Remove limbs within 15-20 feet of the ground. Remove limbs that extend over your roof, or those directly above or within 15 feet laterally of a chimney. If you have a grass lawn that is dormant in winter, mow it closely after all growth has stopped and bag the cuttings. Rake all leaves or needles that are within 30 feet of a structure. Use bedding mulch or straw sparingly close to buildings. Certain popular shrubs are highly flammable. Select the least flammable shrubs that will achieve the desired effect in your landscaping. It is best to build your home on a flat area rather than on a slope because wildfire spreads rapidly uphill. Homes situated on steep slopes, especially slopes that face south or southwest, should have wide firebreaks (at least 75 feet) on the downslope side to lessen a fire's impact. from the line of fire!